Glass paperweight in diamond design, crafted in flawless optical crystal with multi-faceted finish that refracts light in a myriad of ways. 6cm diameter. These stylish glass paperweights are offered at a surprisingly low price for such an eye-catching piece. 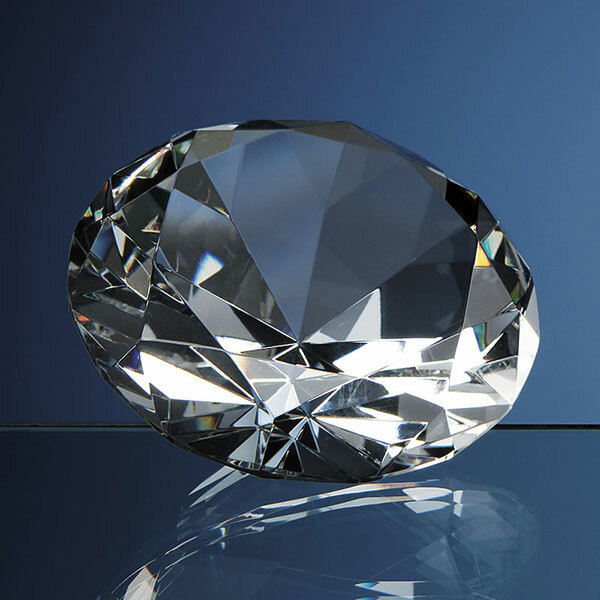 Crafted in flawless optical crystal, they feature a diamond design with hand cut multi-facets that refract light as it passes through, ensuring an ever-changing aspect as the paperweight is held or turned. Standing 4cm tall and with a diameter of 6cm, these hand polished crystal paperweights also include a flat plane on the front that is perfect for engraving. Create stunning logo engraved corporate gifts or promotional merchandise for your company or brand with these quality diamond paperweights and keep your name in front of key contacts, clients and customers.